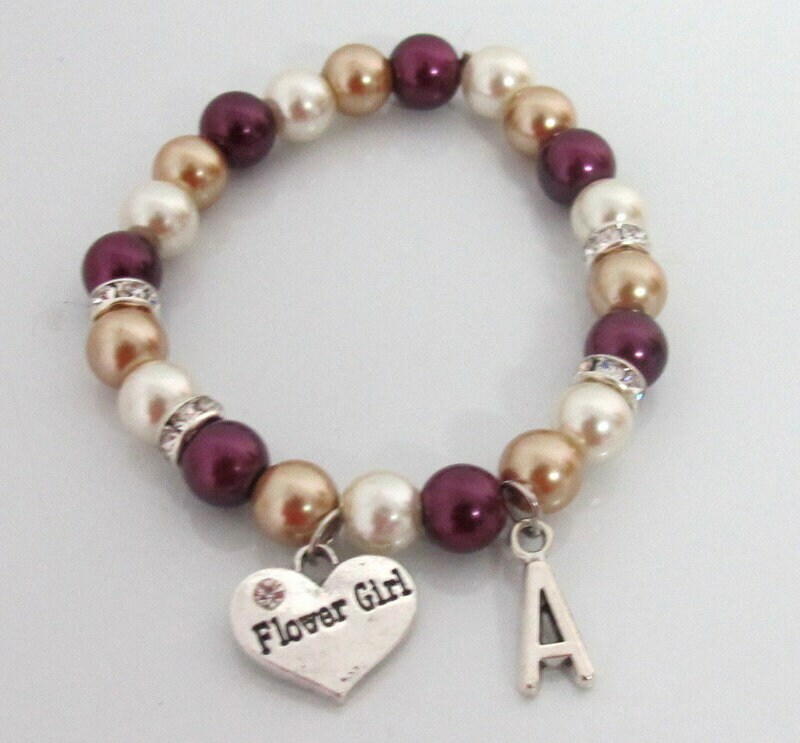 Flower girl bracelet with a great Combo of beautiful pearls - plum, Ivory and Champagne with Rhinestone Roundels, a heart shaped flower girl charm and Personalized with the Initial of the Recipient. This beautiful, lovely looking little bracelet would make a great gift for flower girl, Junior Bridesmaid, Mini Bride and for adults you can gift to your bridesmaid, matron of honor, maid of honor or a birthday gift for your little princess as well. The initial, Charm and the pearl beads are strung on a nice quality of stretchy elastic cord. Please Mention the Age of the Recipient for sizing of the bracelet. You can further Customize your order by choosing the color of pearls either single or a combo of colors from the pictures, but please do not forget to mention in the note section. Thank you! I love this bracelet so much and so does my daughter! Nicely made and fast! This is the perfect flower girl bracelet. I had some questions on sizing and contacted the shop owner. She was very quick to respond and helpful, just what we needed! !